Local Guides is a program by Google Maps in which you "help others explore the world and get great benefits in return" (Google's words, not mine). 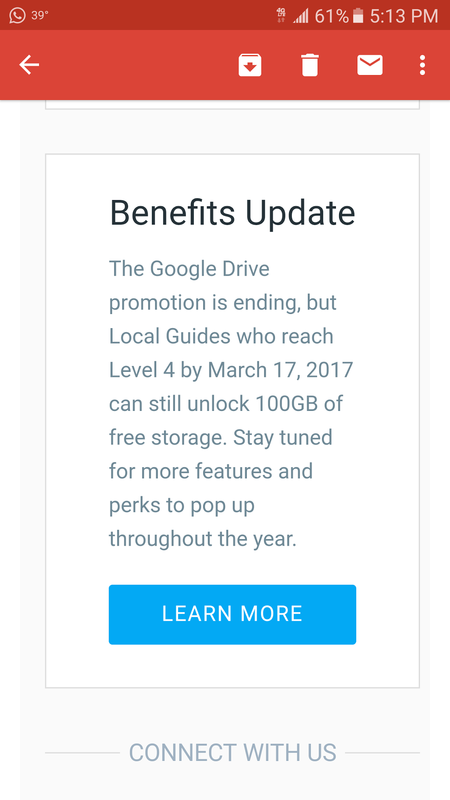 Well, it looks like those great benefits are about to become merely average benefits, as Google is completely ditching free Drive storage for new Level 4 Local Guides, who currently get 100GB for one year. This removal of free Drive storage as a reward follows a similar event from back in July of 2016, when the promo for new Level 4 Guides was slashed from 1TB for two years to 100GB for one year. When that happened, we assumed that Google Maps was having too many people reach Level 4 too quickly; the same thing is probably applicable here. As our global community of Local Guides continues to grow, we occasionally make changes to our program. We look forward to offering our most active and consistently-contributing Local Guides more features and perks throughout the year. Not all hope is lost, though; if you're a Local Guide, you'll still receive your free 100GB if you reach Level 4 prior to March 17th at 11pm EST. As someone who's recently gotten into this whole thing, I'm probably going to be adding to my current 63 points (Level 3) quite rapidly in the span of the next two weeks.